Welcome to the 2015 Shapeways transparency report. We believe that this transparency report will help our community understand how our internal processes and policies are working in practice. Shapeways exists because of its strong community, and that makes it important for the community to understand how our rules are actually impacting them. The transparency report is a snapshot of the system as a whole, as opposed to specific pieces that individual users may come into contact with. This report will also help everyone understand how the legal regimes that govern Shapeways impact how Shapeways operates, as well as the types of legal requests we receive from governments and under the auspices of government-defined processes (such as court orders). These legal systems impact much more than the Shapeways community alone. Governments should represent their citizens, and processes enshrined in law should reflect the intentions of those citizens. Understanding how governments are requesting data from Shapeways and how third parties are using government-sanctioned requests to obtain data from Shapeways is important to everyone. It is impossible to evaluate the laws that control how Shapeways operates without understanding how those laws impact Shapeways and the Shapeways community. This report includes information about intellectual property-related requests. It also provides spaces for information about requests from law enforcement and other types of government requests. While Shapeways did not receive any such requests in 2015, these sections can help give the Shapeways community confidence that their absence from this report is not an unintentional omission. Finally, the report includes a warrant canary that allows us to disclose – to the extent permitted by law – how Shapeways has been impacted by secret government requests for data. If you have any questions about this report or would like clarification about any of the data it includes, please email the Shapeways General Council Michael Weinberg at mweinberg@shapeways.com. This year, we are including both formal Digital Millennium Copyright Act (DMCA) takedown requests and other IP-related takedown requests in this section of the report. In many cases, rightsholders use the DMCA process as a model for requests even if they are asserting trademark or patent rights. A description of our takedown process can be found here. Of note, many requests combine copyright and non-copyright claims, oftentimes using what appears to be boilerplate language for generic rights infringement that includes at least a passing reference to a combination of copyright, patent, and trademark rights that may or may not apply to the specific model targeted in the request. As we noted in a filing to the United States Intellectual Property Enforcement Coordinator in 2015, these types of combined requests muddy the water for both us and our community. While the DMCA provides a clear framework for our designers to contest an accusation of copyright infringement, the lack of similar safe harbor protections for trademark and patent makes that process much more cumbersome when those rights are involved. Without a safe harbor, merely adding an accusation of trademark infringement to a copyright takedown request makes it much less likely that the designer will have an opportunity to contest the accusation. In calculating these numbers, we counted each model accused of infringement as a separate takedown request. Although single requests do sometimes involve multiple models, we feel that breaking those multi-model requests into individual requests makes it easier to understand the nature of the requests we receive. In all, Shapeways received and processed 833 requests to remove a model under allegation of infringement in 2015. Of those, 761 requests (91%) involved a copyright claim, 639 (77%) involved a trademark claim, and 12 (1%) involved a patent claim. 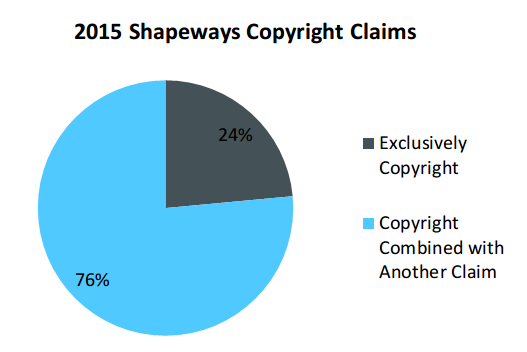 Of the 761 claims that involved copyright, 179 of them (24%) were exclusively copyright claims. 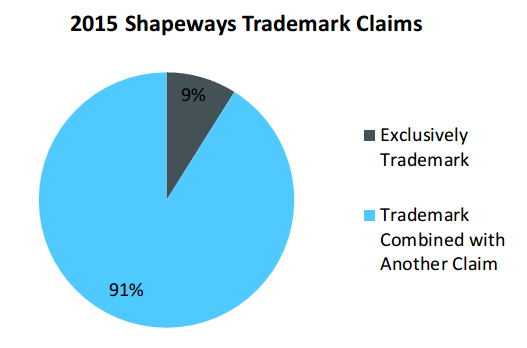 Of the 639 claims that involved trademark, 57 of them (9%) were exclusively trademark claims. All 12 of the claims that involved patents were exclusively patent claims. 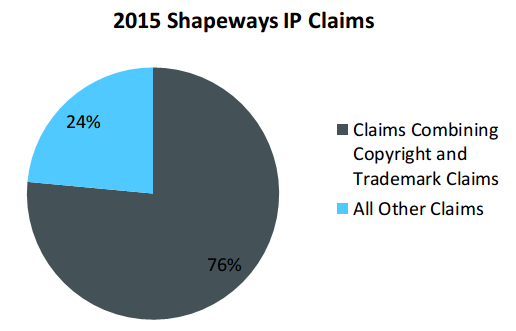 Finally, 582 (76%) of all claims for 2015 were combination copyright and trademark claims. 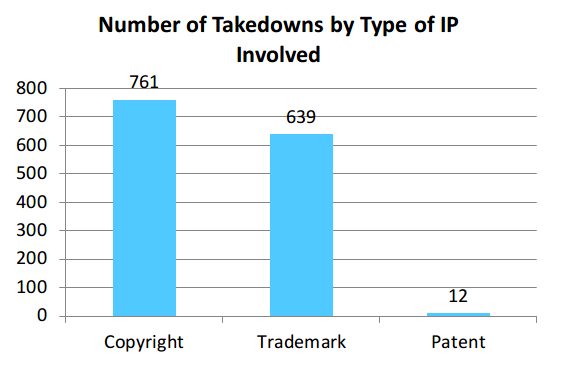 As is clear from the numbers, in 2015 the vast majority of the intellectual property-related takedown requests we received were for complaints that combined copyright and trademark. In the absence of safe harbor protections, this combination significantly undermines our designers’ ability to challenge wrongful takedown requests. We believe that these types of challenges can provide an important check against takedown requests thinly supported by law. As we make clear in our privacy statement, Shapeways complies with government and law enforcement requests for data only upon receipt of valid and sufficient legal process. In 2015 we received no such requests. However, we are cognizant of the importance of maintaining transparency with our community about such requests. As such, we have broken out this section in this report even though we have no requests to report. Shapeways also takes this opportunity to establish a warrant canary. For as long as is lawful and valid, our warrant canary will appear in Shapeways transparency reports. For the period covered by this report (and for all periods prior to this report) Shapeways has never received a National Security Letter, FISA order, or other classified request for user data. You can learn more about warrant canaries, as well as find warrant canaries for other websites you may frequent, at CanaryWatch.org. As with the government and law enforcement requests, Shapeways complies with civil requests for data upon receipt of valid and sufficient legal process. In 2015 we received no such requests. In addition to governmental and civil requests for user data, we are aware that some governments request that content be removed from websites such as Shapeways. In 2015 we received no such requests.